BPW ballrace turntables are characterised by the feature of a double ballrace to guarantee optimum distribution of the axial and radial forces, to minimise wear and extend the service life. BPW Ballrace turntables feature a double ballrace to guarantee optimum distribution of the axial and radial forces that arise. The vertical loads acting on the turntable are absorbed by the larger axial ball race. The horizontal forces are absorbed by the smaller radial ball race. 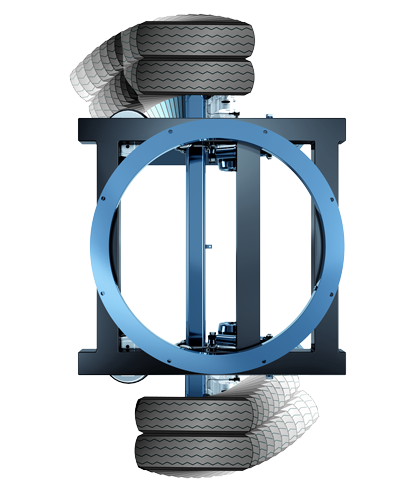 The torque loadings arising from braking and centrifugal force are absorbed in the interplay between the two ball races. The radial ball race retains the upper and lower rings in place.